This client brief involved Website Design and Build, Hosting, Digital and Print Media, Logo Design and Video Media Production services. 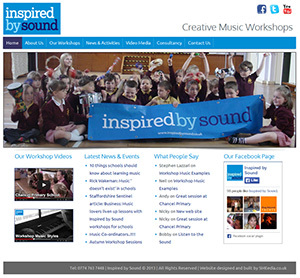 Inspired by Sound offer music workshops that encourage personal creative artistic expression, build collaborative teamworking skills and encourage equal opportunities. Workshops are available for ages Foundation to KS1 & KS2, and also 11 – 19 year olds. We worked with Inspired by Sound to create a bright positive look and feel that was appropriate for it’s business model. We initially set about creating a logo and defined a company colour scheme. It was then a case of creating the structure of the site and working with Inspired by Sound to create the required media. Various print media was designed and produced for Inspired by Sound for both general business use, and also for use in their Music Workshops. Inspired by Sound asked SMEedia to film and produce a short marketing video for use on their web site. We are delighted what SMEedia has done for us. A professional, experienced and co-operative company that provides a high standard of work and great attention to detail. The quality of design is just what we wanted giving us excellent visual elements and informative, well structured content that allows customers to easily navigate between sections. SMEedia gave us a website that brings together all that we are as a company. We can now reach out with confidence and connect with customers in a way that was previously impossible. © 2016 SMEedia All Rights Reserved.